The outdoor Balance Beam Station is a simple tool to practice strengthening still and dynamic balancing skills. The American Council on Exercise states 'balance not only requires equilibrium, but also good stability of the core muscles and joints, particularly the hip, knee and ankle.' 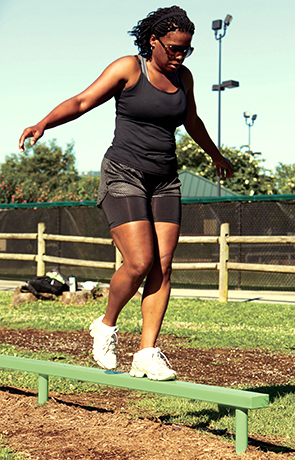 Therefore, walking foot over foot or on ones toes, isolating a leg, jump roping and other skills performed on a the Balance Beam Station helps improve neuromuscular coordination, hip and core stabilization while burning calories. Combining the outdoors with balance training provides the opportunity to disconnect from the distractions of technology or other factors and focus on the skills under the big blue sky. At any age we can tackle the fun challenge to improve our balance, coordination, posture and agility, which makes this Balance Beam Station a fun challenge for anyone.